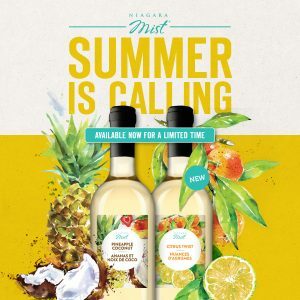 Two new Limited Release styles of Niagara Mist now available! Citrus Twist – Frangrant citrus aromas are followed by flavours of juicy, sweet clementine and a hint of tart lime from the calamansi. Pineapple Coconut – Tantalizing tropical fruit aromas give way to a rush of zesty pineapple and rich coconut flavours with soft mango notes.